The Bosphorus strait separates the two halves of Istanbul, placing one half of the city within Europe, the other half in Asia. Spanning this channel of water is the Bogaziçi Köprüsü – the bridge that connects the two continents. Our great new friends, Bryan and Gizem, who cycled from Holland to Kazakstan and now live in Istanbul, told us that this bridge is usually closed to pedestrians and cyclists. However, just once a year, the Istanbul Eurasia Marathon takes place and on this day, all cars are banned. What an opportunity to cross the bridge on foot and walk from one continent to the other! Bryan, Dan and I caught a ferry across to the Asian side of Istanbul. In the pouring rain, with the roads like rivers and the plastic bag covered marathon runners far ahead of us, we traversed the long bridge, celebrating the marathon’s aims of friendship and peace. If only it were so easy to bridge the gap that divides… the gap between countries and continents, between governments and people, rich and poor, between people of different tribes and cultures,,, the gap within our minds. Can we not all walk across the bridge together and realise the fact that we are after all, living on this earth as part of the same great human family? I feel a great sense of achievement. 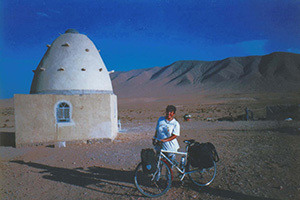 In 1996, I set out to cycle solo from Australia to England. Two years, 12,000 kilometres and many adventures later, I arrived in Istanbul – the Gateway to Europe – … only 3,000 kilometres to go to reach my goal. But it was November and Winter had arrived. Facing Winter in Eastern Europe, fresh from Communism, was not an attractive prospect. So I took a detour and cycled south through the Middle East and North Africa, hoping to reach England via sunnier climes. I was refused entry into Libya and upon my return to Cairo, my bicycle was stolen. My trip ended there. Now, 10 years later, Daniel and I have finally reached Istanbul, having cycled from London across Europe … and I have completed the missing piece of my previous journey.